WHAT ARE THE ORIGINAL LYRICS TO THE HAPPY BIRTHDAY SONG? ...WAIT! Before you go copy/paste-ing, this is a game. 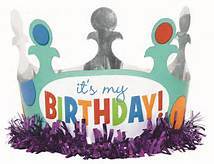 Keep the song going - but - change the words "birthday", "old"; "...years old", etc. WHO'S FIRST?!? Start with a comment. READ THIS MONTH'S COVER STORY, AMERICA'S BIRTHDAY, click the Birthday crown above.